Wonder Woman 2 hasn't been formally announced by Warner Bros. yet, but it has been talked about quite a bit and we know that it is being worked on. Given the insane success the first movie is having, it is all but a formality for the studio to announce it officially at this point. The question was, will director Patty Jenkins be back for the Wonder Woman sequel? We can now say that the answer is yes. 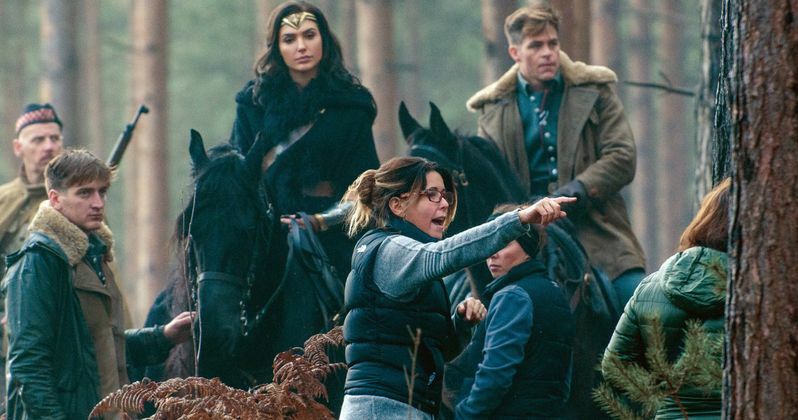 Patty Jenkins recently spoke after a screening of Wonder Woman that was held for female screenwriters and filmmakers and, as reported by Advocate, she addressed the topic of returning for Wonder Woman 2. Since she only signed a one-picture-deal with Warner Bros., it has been a little up in the air, even though all signs pointed to her sticking around for the sequel. Here's what she had to say about it. "I had an epiphany about Wonder Woman 2. I was like, 'you don't have to do this. It doesn't have to be a foregone conclusion that you do Wonder Woman 2.' But then as I was falling asleep I had an epiphany. I was like, 'Wait a minute. You have the greatest character of all time that you love dearly, with a cast that you love sitting at the palm of your hand at this day and age, you can do whatever you want with them, are you crazy?' And then I suddenly realized, it's not more, it's another movie. It's its own movie. And it's got to be great." There is no question that a large part, if not possibly the largest part, of what makes Wonder Woman so special is Patty Jenkins. The movie is exactly what the DCEU needed in every way, both a financial and, perhaps more importantly in this case, a critical success. The other movies in the DCEU have been divisive at best, and both Batman V Superman: Dawn of Justice and Suicide Squad were panned. The fact that Wonder Woman managed to be a critical success and a groundbreaking blockbuster movie, given that it is the first female-fronted comic book movie of the modern age, also directed by a woman, is important. So having the same director back for Wonder Woman 2 only makes sense, especially since Gal Gadot will be back reprising her title role as well. As it stands, Wonder Woman is the highest-grossing DCEU movie domestically, with $327.8 million so far. It is also the highest-grossing movie ever by a female director, which is huge. Since Warner Bros. decided to only sign Patty Jenkins to a one-picture-deal initially, for the reasons just mentioned, it is going to cost the studio quite a pretty penny to get her back for Wonder Woman 2. So we could be seeing a record-setting payday for a female director as well in the near future. The important thing is, from a fan's perspective, is that she is indeed going to return.